Get up to 10 of this item for the same shipping fee as one. Ultra smooth semi-precious stones with a thumb sized indentation are the perfect gift for soothing frazzled nerves using the healing energy of gem stones. 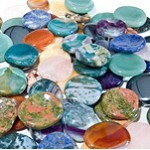 Designed to fit comfortably in the hand these can be used for crystal healing or display. Place them under pillow, on parts of the body during meditation, use for massage or simply hold them to benefit from their metaphysical attributes.